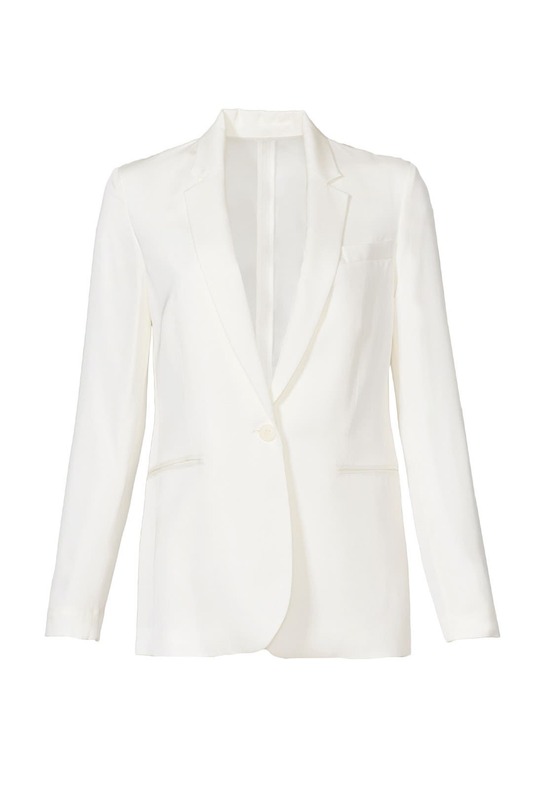 Bring that borrowed-from-the-boys look to life with this blazer by Theory. Polish off the look with delicate jewelry and sleek trousers. This blazer runs true to size. We recommend going one size up for backup (see following fit notes for exceptions). Sized: 0 - 12. White silk (100% Silk). Long sleeves with button cuffs. Notch-Lapels with faux pockets. Lined. 25” from shoulder to hem. Imported. 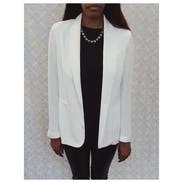 This blazer is super lightweight because there is no lining so it's great for warmer days. The fit is relaxed but not not sloppy and perfect for throwing over a tank top and jeans to look more pulled together. Favorite pairing was with 10 Derek Crosby Lam Flamenco Peplum dress. Nice soft feel but easily wrinkled. Looked a bit too wide for my body with pants. The sleeves were actually adequate length- yay! Runs large. I own several Theory blazers (all the same size). This runs at least a full size large. Lightweight and a bit sheer. The fabric reminds me of Rebecca Minkoff's Becky jacket. great color but the boxy shape due to the fact that it runs large, made me feel as if i was channeling the early 90s look of how blazers were worn back then. Didnt wear, far too conservative for me, a smaller size would have been great to wear out. Definitely looks a little off colored, I assume from all the dry cleaning. 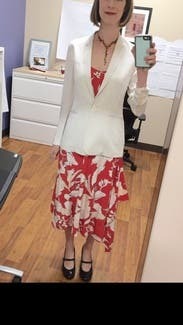 No one else mentions this, but on the one I got, the fabric on the sleeves is totally sheer and is closer to a blouse than it is to the fabric of my other theory blazers. I normally am a 4 in theory blazers, got a 2, and really would have been fine in a 0. One of those unlimited items that I will wear once so I don't feel like the order was a total waste then send back. 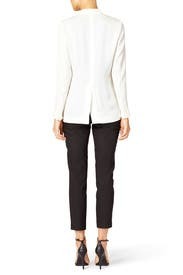 I rented this for work to be worn with black pants and a white blouse. I ended up not wearing it because it was slightly larger than expected and not exactly the "tailored" fit I was looking for. I would definitely wear this as a light jacket for more of a night out over a camisole or with a sleeveless blouse for work. Definitely note that this is slightly thicker material than a normal blousey top. Order a size down, runs big. I wish I had a size 2, but I wore the 4 and bunched up the sleeves with skinny jeans for a more casual look. Cute and rich, but cut strangely. I typically wear a size 2 J Crew blazer and size 2 is my go-to for most coats and jackets - in fact, I occasionally size up because I have longish arms...however, this in a size 2 was quite big. I'm not sure if it was the cut or just the sizing, but it hung off of me and billowed unattractively from the bust down. I would try a size 0 if I rented again. The fabric is a lovely white silk, and despite being clearly brand new it had already snagged on its journey to me - it is very delicate and fragile fabric. Had a professional, yet relaxed feel for the office. It is silk and not as structured as the picture suggests. It may have just been a size too large for me, but this blazer has no shape to it. It looked like a lab coat on me and I didn't end up wearing it. I think if I had sized down it may have been a little cuter. 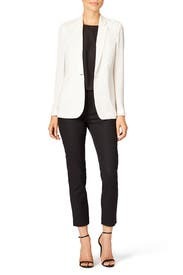 Love this jacket—it's extremely thin/lightweight, perfect for work for summer. Fit was relaxed and comfortable. Only thing is that it could probably use some regular steaming, it wrinkles pretty easily. Super lightweight and fun to dress up or down! This blazer is not fitted at all so I recommend sizing down for your backup. Fit well, except in the chest, but sleeves were long enough. Great material! I liked the jacket a lot. It fit really nicely. My only complaint is the one that I received could have been whiter. Definitely looks worn... I will have fun wearing it though, very cute. I just rented this for work for something different. I typically wear a 6 in theory because I tend to have broader shoulders. It was great for work. I work this to work and out at night. This blazer is pretty sheer; any color will show through it. It also wrinkles like crazy, so you definitely need a steamer on hand for it to look crisp and professional. But once you take it off or wear it for a few minutes, the wrinkles are there! Other than that, it was good. Very feminine and pretty. Pretty but buttons missing on one side and broken on the other!! Good in Theory...see what I did there? Oh this jacket - I wanted to love it. Though nice in theory & true to size, it just looked ridiculous -- like a lab coat. Odd length. I didn't wear it. The material was very thin. If you are looking for a lightweight, simple jacket, this is for you. It came a little wrinkled because of the silky material, so may need to iron. Blazer was nice. It was thin and perfect for a summer day or night. The fit is classic and not fitted. The white seamed more cream and blazer wrinkled easily. I love this jacket. Pro or con, it's very thin, so it's great for summer when you end up needing some more stylish summery coverage for cooler evenings or air conditioned indoors without feeling like you're wearing a sweater in the summer. 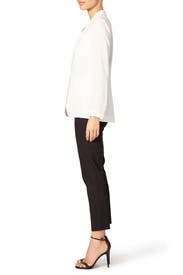 It has that somewhat tailored look without being too stuffy since it's also a bit flowy - feminine but still professional, and you can jack up either feature depending on how you pair it. The back and sleeves are unlined. Just be aware. This blazer is a more relaxed version of the ones your mother used to wear. It's chic, cool and light. The silk makes it polished even without the typical fitted shape.